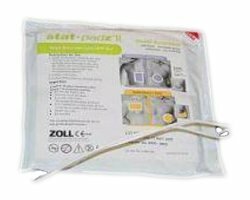 The Zoll Stat Padz II are a two-piece adult electrodes for the ZOLL AED Plus or the Zoll AED Pro. Please note that the Zoll Stat Padz II does not provide CPR feedback like the Zoll AED Plus CPR-D Padz. For owners of the Zoll AED Plus and/or the Zoll AED Pro that may be presented with a situation of sudden cardiac arrest in which a layperson is forced to respond, the Zoll AED Plus CPR-D Padz are recommended due to the guidance these particular adult electrodes provide for responders. For seasoned and trained responders, the Zoll Stat Padz II are the perfect adult electrodes for your Zoll AED Pro or Zoll AED Plus.